Central bank of the Republic of Albania. 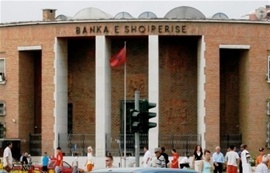 The primary objective of the Bank of Albania is to achieve and maintain price stability. In accordance with obligations arising from the law, the Bank of Albania formulates and implements policies seeking to achieve this primary objective, that is, keeping inflation under control. The Bank of Albania, prior to formulating the policies, determines the intermediate and final targets and the instruments it will use to achieve these targets. The Bank of Albania, in accordance with its primary objective and based on the domestic banking market, promotes and supports the development of the foreign exchange regime and system, the domestic financial market, the payment system, and contributes to improving monetary and lending conditions, supporting the country's economic stability and development. The other objectives of the Bank of Albania, subject to its primary objective, should promote the maintenance of liquidity, solvency and normal functioning of the Albanian banking system based on market principles. Other objectives or tasks assigned to the Bank of Albania are conditioned by the achievement of the primary objective.